Google’s License Renewal in China: Victory, Defeat or Stalemate? When China's government renewed Google's ICP license to operate in the mainland in early July, there was a collective sigh of relief. But although Google successfully renewed its mainland Internet license in China in early July, it could not reach an agreement with the country's authorities to operate an uncensored search engine. Instead, Google.cn is allowed as a landing page that provides a link for conducting web searches through its uncensored Hong Kong portal. From a technical perspective, it's a minor change, but it speaks volumes about how tricky the relationship between the government and Google has become. Since March, Google had been redirecting mainland users automatically to the unfiltered Hong Kong site. This, however, was not acceptable to the mainland authorities. "It's clear from conversations we have had with Chinese government officials that they find the redirect unacceptable — and that if we continue redirecting users, our Internet Content Provider [ICP] license will not be renewed," Google wrote in its blog. "Without an ICP license, we can't operate a commercial website like Google.cn — so Google would effectively go dark in China." China maintains tight control over the Internet, blocking access to a wide range of websites and using filtering technologies to block access to materials deemed sensitive. Authorities require domestic providers of Internet and information services to maintain tight controls over content. 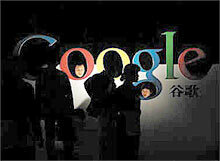 Google.cn, the company's mainland site, was required to abide by this regulatory control. Sensitive search terms and results may still be blocked for users in China, but Google will no longer have to filter information itself. As noted by Alan Davidson, Google's director of public policy, in a U.S. congressional hearing about China in March: "We are well aware that the Chinese government can, at any time, block access to our services — indeed, we have already seen intermittent censorship of certain search queries on both Google.com.hk and Google.com." Google's early July move followed an unusually public spat between the company and the government that included pronouncements about censorship, accusations of industrial espionage, as well as condemnations of the company through state-owned media and official channels. The announcement could signal the end of the Mountain View, California company's public standoff with the government, or at least a ceasefire, but few see the result as a truly satisfactory outcome for any party involved: Google, the Chinese government or mainland internet users. "If it was a victory for anyone, it was a pyrrhic victory," says Jeremy Goldkorn, editor of Danwei.org, a website that covers Chinese media issues. "[Google] will lose money in China over this. But, on the other hand, for Chinese Internet users, there is no real gain in terms of freedom of expression. And it didn't leave the government looking all that good…. Nobody really came out of this looking good." Google, which espouses libertarian notions about freedom of information and speech, has unsurprisingly never had a completely comfortable relationship with the mainland government. In turn, the government's relationship with the U.S. Internet firm also required an often-difficult juggling of priorities: China has ambitious technological development goals and maintains hospitable incentives for large technology-oriented investments. However, the industrial-development policies often conflict with the state's desire to maintain control over political expression and media content. The tense relationship reached a breaking point in January, roughly four years after Google launched its mainland search portal. At that time, Google said it was taking "a new approach to China," one that put it into direct conflict with the government. It said it would stop censoring search results on Google.cn and would seek talks with the government to legally operate an unfiltered search engine. Moreover, the company said it had discovered "a highly sophisticated and targeted attack on our corporate infrastructure originating from China that resulted in the theft of intellectual property from Google." While not directly accusing the government of involvement in the cyber attacks, Google said it had "discovered that at least 20 other large companies from a wide range of businesses … have been similarly targeted," and that it would be working with those companies and "relevant U.S. authorities" to determine the source of and goals of the attacks. The company also said it had discovered "that the accounts of dozens of U.S.-, China- and Europe-based [Google e-mail] users, who are advocates of human rights in China, appear to have been routinely accessed by third parties [within China]." Such a direct and open challenge to a government would be considered extreme in any market. Within China, where the notion of "saving face" is strong and where foreign companies go to great lengths to mention their "commitment to China," many experts said Google was resorting to a "nuclear option." Although Google has been more successful in China than many Western Internet firms, its history has been fraught with problems. Prior to the 2006 launch of Google.cn, the company's market share in the country fell due to periodic blocking of its offshore-hosted search websites, the complete blocking of subsidiary sites such as blogger.com and YouTube, and the occasional redirection of users to homegrown Chinese rival, Baidu.com. Google went from being the leading search engine in China, with its overseas-based portal having a head start on Baidu (which started in 2000), to occupying a sizable second-place position. In the first three months of this year, Google.cn had a market share of 30.9% compared to 64% for Baidu, according to Beijing-based consultancy Analysys International. Baidu's gains cannot be attributed entirely to government interference with Google. As a 2008 study by Jason Yu of Los Angeles-based Internet services firm LingoSavvy noted, Baidu in many cases produced better search results for the simplified Chinese characters used on the mainland. (Google, in contrast, was better at the traditional characters, which are used in Hong Kong and Taiwan). In spite of a decline, Google operated a profitable business and had captured key demographics. It was regularly named the most popular site among higher-income university-educated professionals by the China Internet Information Center and research firm ChinaPolling. It also had far greater success in China than all other competitors, except for Baidu: Neither Microsoft nor Yahoo were able to maintain a significant search engine presence in China; while local firms, such as Sohou and Netease, failed to make significant inroads (both had first quarter 2010 market share of less than 1%, according to Analysys, and neither have ever raised their share above single digits). Though Google did not gain the dominance in China that it enjoys elsewhere — it has a 79.5% global market share and close to 90% in markets, such as Germany and France, according to research firm Net Market Share — it had a relatively strong position in a duopoly market. Given the country's estimated 380 million Internet users and search engine revenues of RMB 1.95 billion for the first quarter, this was enviable. Beyond spirited competition from Baidu, Google's foray into China spawned a bigger problem when it found itself at the center of a political storm in the U.S. From the mid-2000s, after several incidents involving Western firms caught up in actual or perceived human rights and free speech violations in China, politicians and activists began to take technology companies to task. In 2006, Google, Yahoo, Microsoft and Cisco Systems were called to U.S. Congressional hearings to face questions about their facilitation of censorship in China. For Google, a company whose unofficial motto is, "Don't be evil," this was a humbling experience. Late Congressman Tom Lantos, a Holocaust survivor who at the time headed the Congressional Human Rights Caucus, went as far as to compare the companies to Nazi collaborators. While that particular statement was widely seen as hyperbole, it indicates the level of emotional and political sensitivity surrounding free speech issues in the U.S.
"That was a horrible overstatement that cheapens the Holocaust," says David Vise, a Pulitizer prize-winning journalist and author of The Google Story, who argues that Google entered China with more care than competitors Yahoo and Microsoft. Google was "making things easy for people by offering search; they did not go in with their blogging service, or a host of the services they offer elsewhere, precisely because they wanted to protect human rights activists." China's renewal of Google's ICP license and the company's scaling back its business to maintain local regulatory compliance represents a de-escalation of tensions and an attempt at compromise. It is less clear, however, whether the government, Google or Chinese Internet users will gain anything over the long term. On a positive note for the company, even if its China business will now be constrained, Google has gained reputational benefits and public goodwill that will prove valuable in Western markets, Vise argues. "What Google achieved by taking a stand against censorship in China was securing political points in the U.S. and Europe. They are seen as taking a stand for the first amendment and fighting for free speech and this helps Google a great deal," he says. "Google had accused the Chinese government of carrying out a campaign of corporate espionage against it, so Google has scored political points in the West as a 'victim.' They were able to get support and sympathy." The sympathy could be a considerable asset for a company, which due to its size and dominance, faces an unusual set of business risks, he adds. "[Google is] not facing any risk from competition; it's really only facing political risk. In North America and Europe, its biggest risk is that it has such a dominant market share that it will be seen as a monopolist," says Vise. "It is worried about being restrained or reigned in or about having potential acquisitions blocked…." When a company becomes the size of Google, he adds, it's "understandable" that people become concerned about "its concentration of power." Rebecca MacKinnon, a visiting fellow at Princeton University's Center for Information Technology Policy and an activist for Internet freedom issues, agrees. She notes that Google's decision in China gives it leverage and moral authority in other markets where it is facing similar pressures. "Google has a global strategy, and it assumes that what it does in one country … will impact how users view its service globally," she says. "It is dealing with a lot of governments in a lot of countries that want to have a greater say in what Google does and want control over content.… Google realized that if it is to censor in China, it would put them in a much weaker position in a number of countries – including the United States, frankly – when it comes to government regulatory practices. It has to be consistent in how it operates." For China, the tensions with Google created unwelcome scrutiny of its censorship policies and tensions with the U.S. and other foreign governments. Perhaps more importantly, it raised concerns about the country's business environment for information technology firms. "This result will probably dampen the enthusiasm of some foreign investors," says Danwei's Goldkorn, who notes that there were increased tensions in other sectors and that media coverage of high-profile conflicts reenforces this perception. Still, Google's new license may also provide Western firms with some positive indications about the government's policy direction. While China's government generally keeps internal disagreements out of the public limelight, there are internal debates between reformers, who favor more openness, and more-conservative elements, for whom social and political stability are paramount. On this, MacKinnon, a former CNN Beijing bureau chief, says the scaling back of tensions may indicate a victory for the country's more technocratic and industry-friendly elements. "In a way, this has been a triumph for the moderates. There have been people on the industry side in China, and there are people in government, who believe that shifting Google — and companies like Google — out of the China market completely will not be good for Chinese industry and it would not be good for Chinese companies." "As the Chinese government has said in their own economic statements, China's strategy on the Internet is intended to be at the forefront of economic competitiveness, and China wants to be a powerhouse in this field, but you are not going to be a powerhouse – and you aren't going to compete globally — if you are not enabling your companies to compete with the world's most innovative and creative companies," she added. MacKinnon points to a speech in March by Tian Shuoning, a a mainland Internet pioneer and chairman of television advertising and content production company Media China Corporation. Addressing a conference in Shenzhen for IT professionals, Tian said: "Google is also China's best tool for understanding the West. In order to make the West understand the achievements of China's reform and opening, many have to search through Google. Baidu maybe needs 10 or 20 more years before it can be acceptable to the Internet users of the West." Tian continued, "Google is not just for searching. Google represents the future of information technology," through its search engine and cloud computing technology. "When we make this sort of company such a big rival, are we not also rejecting these technologies?" Danwei's Goldkorn notes that many domestic Internet players share the same frustrations as Google and were sympathetic to the company's stand. "Last year, the whole of the industry — including Chinese websites — faced a lot of scrutiny and regulation by the government, which wasn't welcome by anyone," he says. "At a conference of Chinese Internet CEOs last year, [one executive] was complaining that the additional scrutiny and censorship made it very difficult for Chinese Internet companies and industry." For China's Internet users, the effect will depend on how much the government tolerates access to the uncensored Hong Kong site, which it may do. "China does not want to shut down Google down completely because there are enough middle-class Internet users who want Google," Vise notes. " The government doesn't want to upset them." For now, little has changed. While there has been some traffic gain for Baidu, Google's announcement hasn't had a major impact on Chinese users' search engine preferences. In a study published in June, market research firm ChinaPolling noted: "The fact that Google user satisfaction has stayed the same is testament to the fact that Google users are still using Google and getting the type of results they need from the Hong Kong site but also from Google.com, which is still available in China." While Baidu's user numbers reportedly increased, there was also "a very sharp drop in the user satisfaction for Baidu," stated the study. "This validates the fact that a lot more users are trying out the market leader [following Google's announcement] but do not like the user experience, which we've already heard a lot of grumblings about." As Paul Denlinger, an Internet analyst in Beijing and Hong Kong, notes, Google's announcement does not really reflect a win for either Google or the government. At best, it is a stalemate or a draw. But while the two sides may never reach a philosophical agreement on free speech and information issues, Denlinger notes that both probably share a desire for a little peace and quiet. "Google will continue to operate in China, but it will continue to operate under the close scrutiny of the Chinese government," he predicts. "It will take time to rebuild the relationship, and Google will have to quietly earn the trust of the Chinese government if it is going to be able to grow market share in China." At the same time, he says, the government "doesn't want Google to become a high-visibility test case for the West; in the coming year, there will be many other areas for economic friction with the EU and U.S., and Google is especially popular with human rights campaigners. It is wiser for China to keep [the] Google [issue] off the table."